Krishna is loving by nature. In our original pure state, we love Him fully. 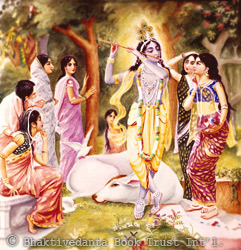 In the exchange of complete love, Krishna considers His devotees greater than Himself. In the spiritual world He always stays with His devotees, and in this world He resides in every heart as the Supersoul. He wants His children in the material world to return to Him to enjoy with Him eternally. Krishna is completely independent, and we cannot comprehend Him completely. He cannot be conquered by knowledge. But He can be conquered—and seen directly—through pure love. God has feelings: He is satisfied when someone offers Him a nice prayer. Even though He is great, He can be moved by our love. He responds to us according to how we approach Him.